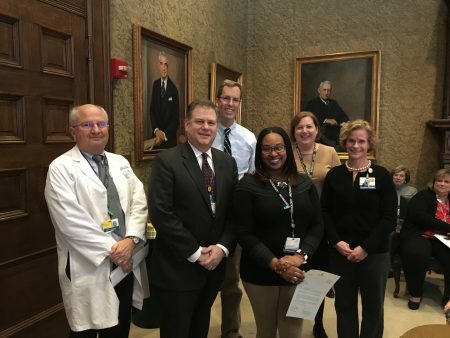 At the Johns Hopkins Medicine Patient Safety Summit held on March 8, 2019, Angela Roots, a lead med tech in Transfusion Medicine, was recognized for her extraordinary actions to prevent harm to patients. Safety Star winner Angela Roots (third from right) with Dr. Paul Ness, Dr. Peter Hill, Dr. Aaron Tobian, Joan Boyd and Val Strockbine, at the Patient Safety Summit. Angie went above and beyond expectations after she received and reviewed a pediatric patient’s diagnosis of Ewing’s sarcoma on a product-prepare order. Angie brought the need for irradiated blood to the attention of the Blood Bank attending who agreed the patient should receive irradiated products to prevent transfusion-associated graft vs. host disease (TA-GVHD). The HERO Event Action Team voted unanimously to award Angie a Safety Star. Each year at the Patient Safety Summit, two Safety Star recipients from each JHM entity receives special recognition for their contributions to patient safety. Angie was again unanimously voted as one of the JHH recipients to be recognized. Congratulations, Angie, you certainly do make a difference! Thank you for your commitment to our patients.